This is a Card Buffet style class to stamp a Stack of Cards for your Christmas Mailing or to bundle as a thoughtful Gift or even to just build up your own Stash. Choose from 8 different Christmas cards and stamp as many as you would like, in multiples of 4. You choose which cards you want to stamp and how many. These are quick and easy cards, but beautiful and you'll love sending them! Please RSVP with the card design and the quantity of each that you'd like to stamp. 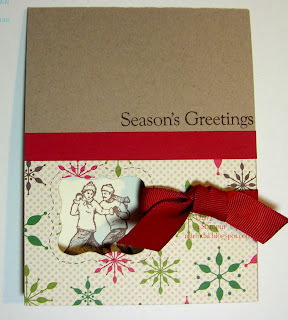 I will have your supplies cut and bundled for you to start stamping as soon as you arrive! Remember you will be stamping at least 4 of the card you choose, and the quantities you choose will be in multiples of 4 - for example, 4, 8, 12 or 16 of a particular card style and 4, 8, 12, of another particular style. Cost is $6 for every 4 cards. RSVP's are needed no later than Wednesday, November 4th. All pre-paid RSVP's will receive a Gift from me! This vintage style card uses the Movers and Shapers Curly Label Die for the Big Shot to cut a 'window' in the front of your card. The skaters image is stamped on the inside of the card. How fun is this card with a unique Belt Buckle opening? This is a variation of an original design by Jen Bailey. 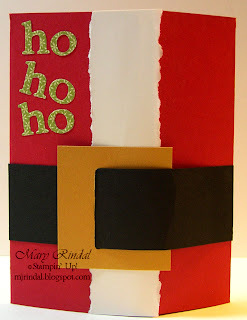 An elegant design paired with low key coloring creates a beautiful card for this Christmas season. This is a variation of a card by 'Stampmoore'. 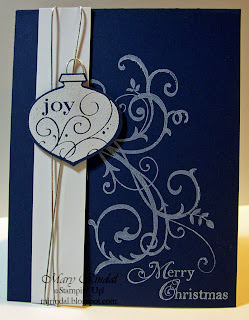 This card has a little bit of embossing on it, but is quick and easy to make using the coordinating Ornament Punch. This is a variation of a swap card received from Kim Bolzenthal. The gorgeous Serene Snowflake stamp set paired with this beautiful color combination makes for a beautiful card for the holiday season. This was inspired by a card of Heather Summers. Use the gorgeous Platinum Shimmer Paint on a Basic Black card to create this stunner. Quick and Easy, too! 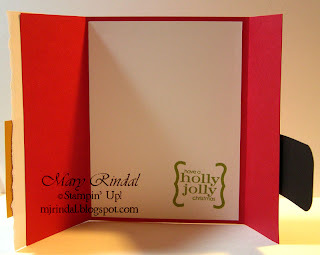 This beauty is an oversized card that will accommodate your 4x6 Christmas Photo and leave a small area to write. Fits in a 'business' size envelope. 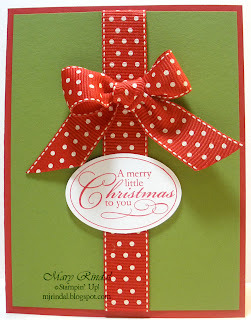 The red and green of this card and the fun Polka Dot Ribbon make for a fun and classic Christmas card. You will love how quick and easy this card is! 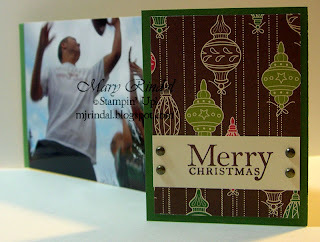 This is a variation of a card by another Stampin' Up! demonstrator.